The day wore a somber mood as we embarked on a SunCruises ferry at the CCP Complex along Roxas Boulevard in Manila headed for Corregidor Island. Located just 48 kilometers way in Cavite province, it is a mere 45-60 minute ride. 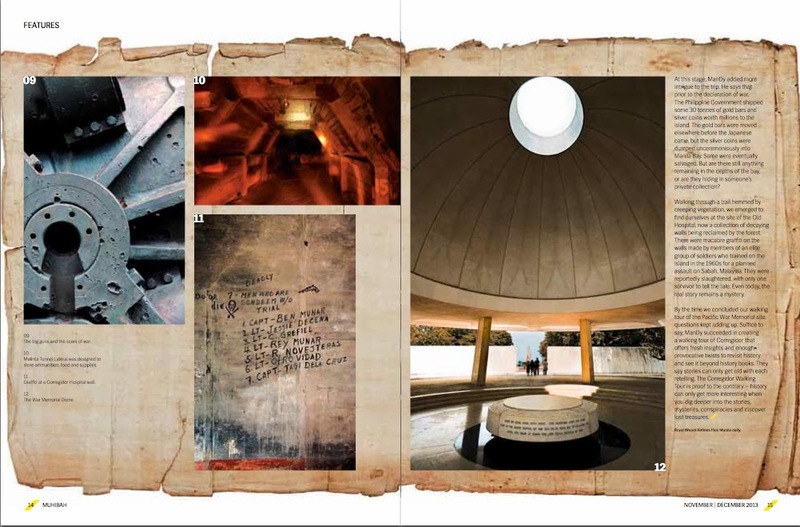 But it just as well be half-a-century distant from the present, an island ravaged by war and left in ruins as a memorial to war and its savagery. Or perhaps a reminder to a generation increasingly more interested in the here and now, consigning the lessons of history to historians and scholars. Almost 70 years after the second world war, there is a tendency to forget especially in a nation known for its short memory where last week’s headlines can seem just like a vague, passing blur. More than two-thirds of the passengers on the ferry – veterans on a sentimental journey, curious adults, a handful of kids most probably coerced by their parents to join the day trip -- will be taking the standard day tour of the island. Riding on special gas powered replicas of electric trams that ran from the island’s Topside to Bottomside, and accompanied by either an English or Niponggo-speaking guide, they will go to key points around Corregidor and blitz through a timeline spanning a century and be given bite-size bits of information mostly condensed from the history books. Call it marching to a different drummer but our group will literally be taking the road less traveled or in this case, trodden. Renowned Old Manila Walks head guide, Ivan ManDy, the same guy who took Anthony Bourdain through the food trail of Manila’s Chinatown, calls this walking tour, “Of Bombs, Big Guns and Lost Gold” The title alone alludes to stories of intrigues, mysteries and conspiracies.Having attended the “standard” version of the Corregidor tour many times over the years, I was intrigued by the prospect of learning something new. 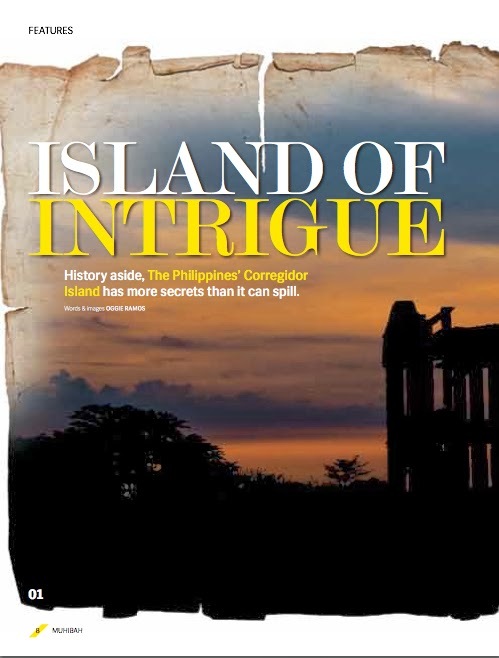 What we got was a provocative retelling of Corregidor’s lost history. We got off to a start at the oldest structure on the whole island, the lighthouse, originally built in 1853 and rebuilt after WWII, in the 1950s. Perhaps, it’s also a symbolic gesture that much in the same way that the lighthouse guided ships going to and from the entrance of Manila Bay, starting here would illuminate our minds with a fresh appreciation of history. We stop at the Spanish Flagpole, a mast of a Spanish warship captured by Admiral George Dewey of the American Fleet in 1898. It is especially significant since Gen. Douglas MacArthur ordered the hoisting of the American flag on this very pole upon his return to Corregidor in May 1945. 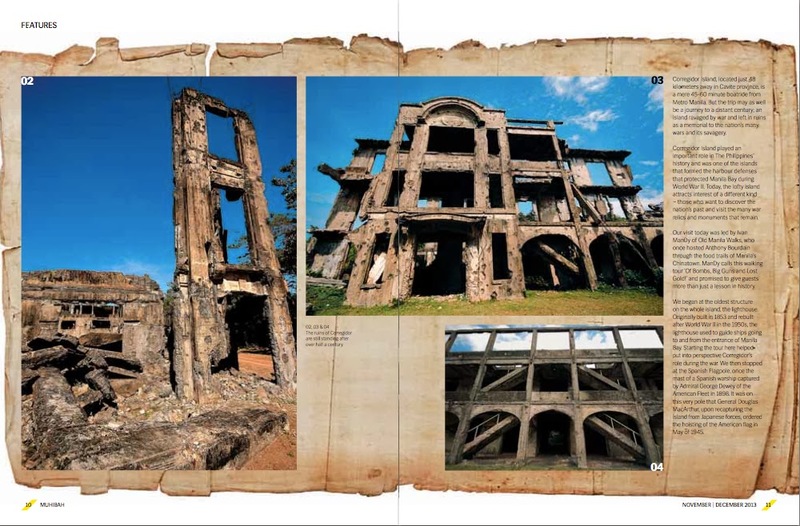 We then meandered through the Officers and Bachelors Barracks, taking note of fireplaces, rather unusual features in the tropics and the nearby Cine Corregidor. It’s mind-boggling to think that an island all of 2,200 acres in size not only had its own movie house back in the 1930s and 40s, it even had a 9-hole golf course. Treading through the ruins of Mile Long Barracks, it is fascinating to see indoor pools. Though its name is a misnomer, the entire length being 1,520 feet or a third of a mile long, it was the world’s longest military barracks, a hurricane-proof three-storey building housing American officers and enlisted personnel. Was this more of an island paradise than a barracks? No visit to Corregidor would be complete without seeing even just one of the big guns. A visit to Battery Way was on the itinerary, not because it was the most important (it played a very limited role during the Philippines Campaign in 1942 with only one mortar tube serviceable by the time the Japanese forces landed on the island) but rather to illustrate a point: the weapons on the islands were mostly obsolete by the end of the first world war, overtaken not only by advances in naval gunnery and ship design but also by the Washington Naval Treaty of 1922 which effectively put to stop any further fortifications. Would that have made a difference in the sieges leading up WWII? As the final bastion of the Allied forces in the Philippines, ManDy says the Philippine government shipped some 30 tons of gold bars and silver coins worth millions to the island before the declaration of war. The gold bars were moved elsewhere before the Japanese came but the silver coins were dumped into Manila Bay. Some were salvaged. But are there more lying in the depths of the bay? Or hiding in someone’s private collection? Walking through a trail hemmed by vegetation, we emerge and find ourselves at the site of the Old Hospital, already an eerie sight of trees taking root on some of the decaying walls. Reading the graffiti on the walls made it even eerier – scribbles of members of an elite group who trained on the island in the 1960s for a planned assault on Sabah but were reportedly slaughtered – the Jabidah massacre. History or conspiracy theory? By the time we concluded our walking tour at the Pacific War Memorial site, the questions kept piling up. Was the American’s Expansion of Good Government and Commerce a more convincing propaganda than the Japanese’s Greater East Asia Co-Prosperity Sphere campaign? How effective was the Japanese enticement of food, wine and women in convincing the tired and hungry Filipinos to lay down their arms? Did former Philippine President Jose Laurel deserve the label of being a “Japanese collaborator”? The walking tour offers a fresh, provocative twist to revisiting history and examining the facts more deeply. In doing so, ManDy exhorts the walking tourist to look at motives of agendas from different perspectives and see that war is not just fought with guns but with ideas to win over hearts and minds. They say stories can only get old with each retelling. 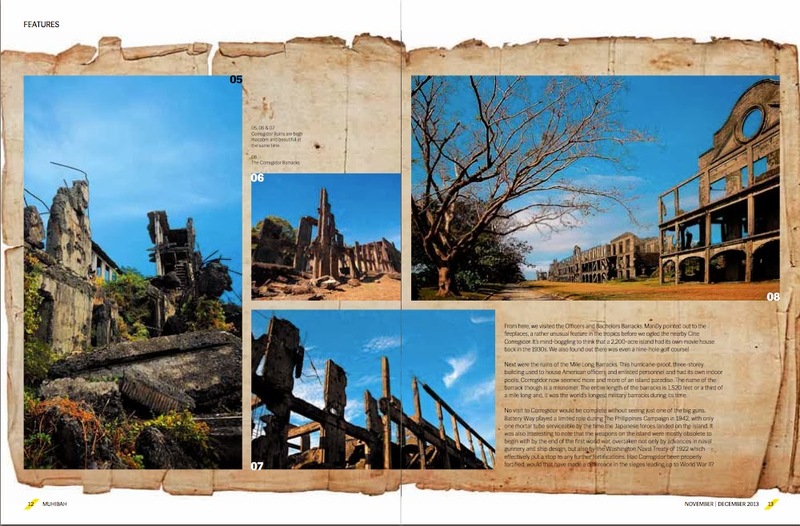 The Corregidor Walking Tour is proof to the contrary -- history can only get more interesting when you dig deeper into the stories, mysteries, conspiracies and discover lost treasures. An edited version of this feature appeared in Royal Brunei Airlines Muhibah Magazine in November-December 2013. All photos and text by author.